The Rangers came into the game last night on a three game winning streak, facing off against a surprising Montreal Canadiens team that was much better than expectations. The Rangers went down early, and then went down by a pair in the second period. But the Blueshirts came roaring back with four (!!) unanswered goals to erase a 3-1 deficit for a 5-3 win. If there is one thing the Rangers have, it is a never quit attitude. They were again down by a pair of goals, erased the deficit, and solidified a victory. The kids played a huge role in this one. Neal Pionk’s game winner was a thing of beauty. Tony DeAngelo had a strong game on both ends of the ice. Both Filip Chytil and Lias Andersson had strong games. This was a rare game where Henrik Lundqvist didn’t need to stand on his head. It was also a rare game where Carey Price wasn’t his elite self. None of the goals scored were on either goalie, not by a long shot, but neither needed to stand on their heads. Neal Pionk made a rookie mistake here. It’s ok, it happens. In the position above, Pionk is looking to stop the Jeff Petry pass out of the zone. Pionk used his skate to try to stop the pass, but it got through him and right to Tomas Tatar for a 2-on-1. Tatar scored on the rush. In the future, Pionk should be ensuring he uses his entire body to keep the zone. Kevin Hayes and Pavel Buchnevich combined to force the Habs into a turnover at the blue line, which sprung Hayes and Chris Kreider for a 2-on-1. Hayes’ initial pass was blocked, but he got the puck back and threaded it to the still open Kreider for the open net. There was some unfortunate luck here, as Brady Skjei broke his stick and the Rangers were scrambling a bit as a result. However that doesn’t excuse four Rangers watching the puck with Tatar wide open in front. Easy deflection goal for him. Can you spot the issue with the penalty kill here? That’s a lot of traffic in front on the Tony DeAngelo shot. Pavel Buchnevich made a good play here to get body position in front to get the rebound on this shot. But the play itself begins with Marc Staal chipping the puck out from the corner to Kevin Hayes, who started the rush up ice. Hayes found the fourth man in, you guessed it, Staal. Staal got the puck on net, and with Buchnevich’s body position, he was there for the rebound. Neal Pionk. And an f-bomb. Vlad Namestnikov and Mika Zibanejad did a good job on the breakout here, keeping the zone (barely) before they were able to get a mini rush. Zibanejad tried to get it through to Namestnikov, but it was blocked. Zibanejad got position for the loose puck and sent it top shelf for the insurance marker. That makes it four in a row for the Rangers. There’s a part of me that wants them to lose for the draft pick, and let’s be real, they are going to lose a lot of games, but I’m thoroughly enjoying these wins. It sets the tone and expectations with the kids that they are expected win. Mentality plays a big role in development. #LoseForHughes is still a go, but watching them come back like this is pure joy. "Rangers erase two-goal deficit, down Habs for fourth straight", 5 out of 5 based on 10 ratings. One of the most exciting Ranger games I’ve attended in a long time, and I go to most of the home games. Had to be awesome to witness, I jumped up off the couch many times! Unreal, it was down at my end of the ice, as we see the Rangers shoot twice at our end. Was one of those “did I see what I thought I just saw????!! !” type of thing. Just great. Yes this was a great game to watch and thank the Lord it was on election day so I could get away from all the BS. For about 190 feet I thought # 2 was on the ice. A great decision that worked out and you got to like Pionk’s courage of going through the trolley tracks to the net. The more I watch coach Quinn and the more I listen to him speak the more grateful I am that we got rid of a stubborn old goat. A great lesson for old politicians. Why is Cody in the lineup? So he can be an anchor for Chytle? We could have gotten 2 more goals if Cody was not in the line up. How about you Fasth fans? Haven’t herd from you in a while. Things have changed yet they are still the same. That was really a solid win and everyone contributed. Even Mark Staal was good last night, Liked how he leveled Gallagher in front of the net short handed. he had some snarl in him last night. Pionk is such an interesting player. That was a nice goal to put them ahead. I liked Buch’s hustle last night. He seemed more engaged away from the puck. Nice game for Hayes, Kreider and Zib too. Namestnikov also seems to be playing much better. Buch’ s new line suits him. He should be finishing more on his chances with Hayes down the middle. This was the most exciting game the Rangers played in a while. They came together like a 5 man unit all over the ice. Not a perfect game but you can see them coming together. When he pulled the spin O Rama I immediately thought he better out skate the Canadien and get the ice or else he’s gonna hear it in the locker room for that O LAY move… but he just kept the jets on, and then when he cut crossed the paint, Oh Man that was special to see. Really happy for that kid! That was so much fun to watch, they dont quit. Nothing like a good hockey game to keep lessen the temptation to turn to the news sites for election results! The comback was pretty stirring. Tony DeAngelo, another solid game. Is there any reason to sit that kid in favor of McQuaid now? Neal Pionk, another outstanding game. Andersson, a couple of penalites, but looked strong and made a really nice move on a shot attempt. Zibanejad, Kreider and Hayes all were solid, and Mark Staal must have hit the energy drinks, because he had a lot of gumption last night. One thing that was noticeable to me was that they started winnning face offs consistently as the game went on, and that was clearly advantageous. The team doesn’t quit. That bodes well for the future. McQuaid shouldn’t be an issue. DeAngelo has played 128 minutes and been on the ice for three goals against. He has absolutely not been an issue defensively and no one is questioning his offense. Now, that is a very small sample size and it is reasonable for a coach who doesn’t like the way he looks to be suspicious. But given his talent, a suspicious coach still needs to collect more data at this point. Certainly you do not bench him now to play McQuaid, who is a known quantity, not terribly good, and not part of the future. Amore serious dilemma is posed by Claesson, who should play when he returns — but who comes out? I might have a revolving seventh defenseman (with a healthy McQuaid eighth). kind of tired about whining about how gorton constructed this roster to stay middle of the pack. reality is in the points for everyone league we wont really know about draft positioning until after the trade deadline. anyway that pionk goal made me pull back for moment and go wow. Quinn defiantly didn’t deny that Chytil is fighting for a spot here. Maybe it’s between him and Lias right now? Well either way he had two open nets to shoot in last night. Hayes set him up with a slap pass in the low slot on a PP. He missed on that one and he completely missed his chance on 5 on 5. Tatar put a clinic on him in the DZ around the boards. That can’t happen, that guy scores his points off the rush but not by being gritty around the boards like last night. At this point Semin or Gaborik could maul Chytil if they wanted to. Yeah its tough call between the two RN, chytil def more dynamic in the o zone, transition game still a struggle for him getting by NHL d men. , lias makes the little plays better tho atm, had that one great look on price , easy save. Just a random observation – it seems Chytil plays better when Lias is around…. 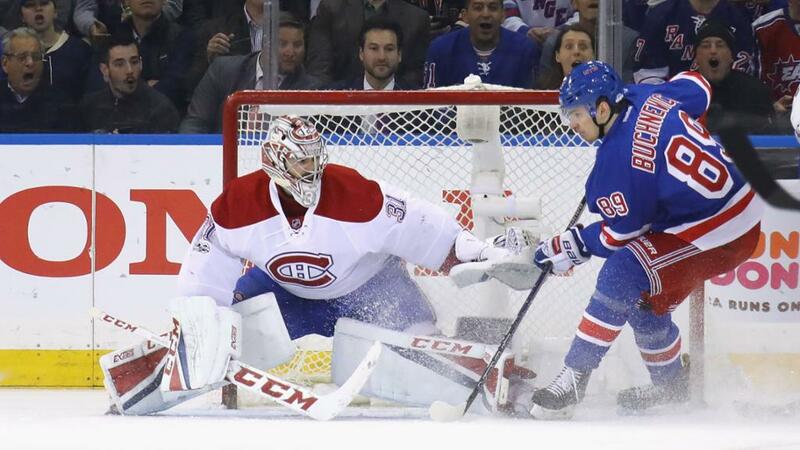 The Rangers showed last night that they weren’t willing to roll over and accept the lost. Lias fit right in and the Rangers young dmen continue to improve. Keep it going Rangers, bring on CBJ. Dave thanks again, but I for one, am not on the “lose for Hughes” train. I love this new coach and how he is handling this young team. 100% accountability! What better way to learn. This was, by far, the Rangers best game of the year and with Hank in net, who’s to say this team can’t go far. Until they are mathematically eliminated, I am going to continue to root for a playoff position and a hot team and net minder to take us to the CUP! Why not?! Would it really be the most impossible thing that ever happened? I think not. Let’s go Rangers! Well guess what? The mananment has never been on the train either, JG was never going to make this roster fully green. If we keep going at this pace, we will be buyers at the trade deadline instead of sellers! DQ, you put Buch on a good line and he does well. I am sure you benching fixed the problem and not what line you put him on. You did not want to put DeAngelo in and he is also playing well. You like Tanner Cody and don’t want 4 balanced lines. Why? I am not even going to talk about Fasth. Other than that you are doing OK. I think DQ has a mindset of what combinations he thinks works, and then due to injuries, and player abilities, he is finding what is actually working. The only big move left for the time being is sending Chytil down to the Pack for a few weeks. I think Gorton wants him to score so we have an excuse to keep him at the NHL level. Chytil needs to be moved away from Cody for a few games let’s see what he can do with 2 wings. He does not look comfortable on the PP. DQ has to get him some mins with a better pair of wings see what he can do. If that does not get him going a little vacation in CT is in order. He did not seem to play at all in the 2nd period he was good in the first though. I’m not all that interested if we win or lose I want to see them play hard which they are, and progressing the kids. Tony D, Neal, Buch and the 3 rookies. Let’s not get ahead of our selves here please no cup talk can’t get too high or low off the game results. Just the progress of the kids. I am interested in wins and loses, the type of games you lose but can hold your head up even grow from and of course last nights win was something you can’t see as only a W in a WL column. I agree with you about not caring about their record overall, I know what you mean but I just feel if the team battled and lost this game it may not have had that certain type of effect on them as raising their sticks to the home crowd at the end did because they won it! Too many penalties for him to get any real ice time in the 2nd period (Quinn said as much) … but I agree, they have to get him away from number 8, would prefer a line of Lias with Chytil and Lettieri on the wings. Attended the game up close last night. Here is what sticks out: NYR vets are having to break free of passive AV play such as net front and PP; PP looked slow and tenatative…ridiculous…no sense of urgency….they will break this habits; net front remains an issue…not consistently clearing it (that is a reason for McQ)…like any goalie, Hank needs room to work; in general, team plays better and fans appreciate more when it plays with snarl; impressive sticking up for one another, McLeod included…he didnt deserve all those PM, a simple charging or boarding would have sufficed. As DQ said: every NYR doesn’t have to go out and kill an opponent, but they do have to play as physically as their stature amd game permits, and take space away. Lots of potential here and right coach. Lets watch as we get to Dec. Lets go Rangers! There is a real problem with that PK unit. I believe the Rangers have given up twelve PP goals. Staal has been on the ice for ten of them, Pionk and Zucc for eight each and Zib for 7. I would guess seven of the goals were scored against the same four player unit. I could never keep track of which of the D men where out there for those goals against on the PK. I knew about Zib and Zucc unit always out there but I lost count after the 9th goal against them. Are you sure that you have your numbers correct? I would have guessed 11 goals including last night. I’m going to assume that you’re more accurate with this stuff. Well either way, that press that was around the boards by MTL was bad. I remembe when the Sens fans warned me about Zib’s DZ game. That comment got over 60 votes up in Reddit within 36 hours. On the NHL.com site, you can select +/- and it lists PPGA for each player. You can also just select Rangers so you don’t have 500+ names. On another screen (I don’t recall which) you can also get TOI for PP, PK. Amusing fact: I know he hasn’t played much, but Claesson has never been on the ice when the opposition scored. McQuaid will be out for a while yet, but an interesting decision looms when Claesson is able to play (and that will be soon). Do you think maybe a deal shipping someone like Hayes out of here us coming relatively soon…. or sooner than we think? Lias is here now, and they keep indicating that it’s not just a short stay. And Howden is clearly not going to miss much time at all. So is a trade very close? Or maybe Chytil is Hartford-bound? I think trading Hayes would be a big mistake, unless of course he wants north of 5 mil and term of more than 4. If that is the case, trade him. I thought Pionk’s and Mika’s moves on the goals were truly elite — I’m not suggesting either is elite, but they both evidenced some real elite skills on those goals. How Mika was able to avoid going offside and then not only came away with the puck but also create a good scoring chance was a thing of beauty — as for Pionk, that was his best impersonation of Bobby Orr, all that was missing was the flying through the air. I think Hayes was right, they are building something — an identity that seems more in tune with the mental toughness Torts left us with and that was lost in the last two years under AV. I gave you a thumbs up, but let’s not bring Torts back into this team, he has nothing to do with what is happening here. Whats happening here is part of the rebuild, and has an awful lot to do with Mr. Quinn and his philosophy. The Torts’ ship has sailed, I was merely referencing that mental toughness and fortitude that HE instilled on the core of those teams from 2010 through 2015 (AV was also a beneficiary of that toughness Torts imparted to the team) — those teams were NEVER out of any games, they always fought tooth and nail, they were PROUD both individually and as Rangers.